I knew, as everyone knows, that the easiest way to attract a crowd is to let it be known that at a given time and a given place some one is going to attempt something that in the event of failure will mean sudden death. 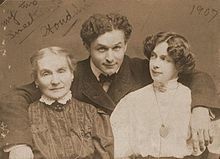 Harry Houdini (24 March 1874 – 31 October 1926) was a Hungarian-born American stage magician, escapologist, stunt performer, actor, film producer and investigator of spiritualist claims; born Erik Weisz he used the name Ehrich Weiss until legally changing his name to "Harry Houdini" in 1913. Disloyalty in trusted servants is one of the most disheartening things that can happen to a public performer. But it must not be thought that I say this out of personal experience: for in the many years that I have been before the public my secret methods have been steadily shielded by the strict integrity of my assistants, most of whom have been with me for years. Only one man ever betrayed my confidence, and that only in a minor matter. But then, so far as I know, I am the only performer who ever pledged his assistant to secrecy, honor and allegiance under a notarial oath. Rosabelle — answer — tell — pray, answer — look — tell — answer, answer — tell. The effects produced at some of Houdini's "seances" were brilliant, and had he claimed the possession of genuine psychic powers he would have made a fortune. He had the essential masculine quality of courage to a supreme degree. Nobody has ever done and nobody in all human probability will ever do such reckless feats of daring. His whole life was one long succession of them. People either didn't believe Houdini when he said that his tricks on film were real, or they didn't care. Illusion became big bigness, and the magicians were out of work. This page was last edited on 30 October 2018, at 17:58.